I think it’s safe to say that director Jean Renoir was surprised by the initial audience reaction to his now-classic film, The Rules of the Game. On July 11, 1939, The Rules of the Game premiered at the Paris Colisée, with Renoir and other members of the cast and crew in attendance. Halfway through the film, the audience started to whistle and boo, with one patron actually attempting to set his seat on fire as a form of protest. While the film may seem harmless today, for an audience in pre-WWII France, it was downright scathing. With the mood in Europe growing darker by the day, France chose to shield itself behind a patriotic furor, and The Rules of the Game dared to show a French aristocracy that was complacent, even somewhat bumbling, in its nature. It was not how the French saw themselves, and certainly not how they wanted the rest of the world to see them, either. The majority of the action in The Rules of the Game (the French title of which is La Règle du jeu) takes place during a weekend hunting party at the château of Robert de la Cheyneist (Marcel Dalio) and his wife, Christine (Nora Gregor). Among their guests is André Jurieux (Roland Toutain), an aviator who has just set the world speed record for crossing the Atlantic Ocean (a feat he accomplished primarily to impress Christine, whom he loves). Other visitors include Geneviève (Mila Parély), Robert’s mistress, and Octave (played by director Renoir himself), a friend of André who speaks to Christina on Andre’s behalf, yet who is secretly in love with her himself. Along with the upstairs shenanigans, we follow the exploits of the downstairs staff, including Lisette (Paulette Dubost), Christina’s flirtatious chambermaid, who is married, quite unhappily, to Edouard (Gaston Modot), the estate gamekeeper. As indiscretions build and tempers flare, a relaxing weekend in the country is very soon transformed into 48 hours of unbridled chaos. The Rules of the Game is a lighthearted, witty, whimsical film. Even so, it’s easy to see why some mistook it for a direct assault on the French aristocracy. When thousands of people, among them government ministers and members of the press, show up to congratulate André on his record-breaking flight, the suddenly-famous pilot expresses only disappointment that Christine is not among the throng welcoming him home. In frustration, the new ‘hero’ acts childishly, and refuses to accept the accolades being heaped upon him. After all, it wasn’t for the glory of France that he flew across the Atlantic, but the love of a single woman. Marriage also takes one on the chin in this film, as Renoir shows, in great detail, the little regard this particular branch of French society pays to the vows of marriage. Moments after Christine has told her husband, Robert, that she trusts him completely, Robert rushes off to call his mistress, Geneviéve, arranging to meet her the very next morning. 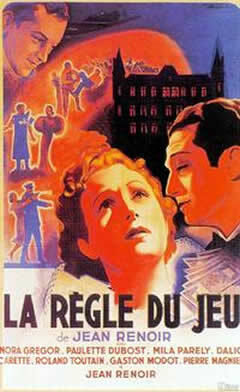 While Renoir didn’t initially intend to spark controversy with The Rules of the Game, he did admit, much later, that one of the film’s goals was to expose a society he believed was “rotten to its core”. Unfortunately, for this particular audience in 1939, the story hit a bit too close to home, and as Renoir learned, world events sometimes make it extremely difficult for people to recognize that reflection peering back at them in the mirror.